For Standard DSLR and Lens:Total of 6.5"
This ballistic nylon bag opens away from your body providing extra security and making photography easier and more efficient. The separate tip-out organizer within the main compartment holds extra batteries, memory cards or other small items. There's also a neat little built-in rain fly that can provide extra protection while you're out on the trail and the weather turns foul. The back panel is wide and comfortable while the supporting harness straps radiate out from its edges. Two straps go around your waist while the other two extend up and around your neck. All straps are adjustable to suit your need. Quick-release buckles make attaching and removing the straps easy. Box Dimensions (LxWxH) 9.9 x 7.0 x 6.5"
Standard SLR Chest Carrier (5.9 x 5.1 x 1.5", Gray) is rated 3.3 out of 5 by 9. Rated 2 out of 5 by GP from Bag Is Small/Interior Dimensions Are Inaccurate I purchased this to use for hiking in conjunction with a backpack and my standard-sized DSLR and zoom lens. The lens measured less than the 5.5 maximum stated by the manufacturer on B&H's site. I contacted the manufacturer directly to ensure that my body/lens combination was appropriate for the case and they confirmed it was. I could not even zip the case closed, no less use the pocket under the lid. On the positive side, it is well-constructed. I returned it to B&H for a more accurately-sized Think Tank holster. Rated 4 out of 5 by bradicalg from Great carrier for my 5D Mark ii I've used this carrier now for 2 weeks and have no major complaints. It fits my Canon 5D Mark ii with 24-105mm L lens with UV filter and lens cap and that's about it. I noticed one review that said it wouldn't fit but I tried it anyway and I'm glad I did. It worked for me but I highly recommend removing your camera's original neck strap and using a hand grip or wrist strap to save room. I like the included tether strap in this case and find it really useful. I use this carrier with my Clik Elite backpack and the chest port adapters fit the two together perfectly. My family travels around the world a lot and I need gear that lets me get my shot quickly before my young kids lose interest and this is exactly what I needed! My only complaint is that there's no way to keep the straps tidy after you cinch them down but I added some elastic tabs with a sewing machine and it works great. Rated 5 out of 5 by hresult from Excellent carrier I hike and climb quite a lot and I like to take pictures during my trips. I can fit Canon 40D with 17-40 f/4L lens (with hood removed) into this carrier, so smaller DSLR with comparable lens should fit just fine. This carrier has good water resistance, durable and conveniently operated. High recommended. Rated 3 out of 5 by Redquill from It won't fit with a larger diameter lens The product seem to be well made and that's why I gave it a 3 star. Unfortunately, the design of the bag has a taper makes it won't fit certain lenses. My EOS 24-105 lens has 77mm lens and the lens won't fit. I actually called Clik Elite and the customer service guy was very nice but what he told me was wrong. The length will fit but won't fit the diameter of the lens, beware. Rated 1 out of 5 by Mark from large case I had purchased this with the intent of using it outdoors in the winter. A minimal size case was important. It didn't look so big in the pictures but on receiving it, the case was very large. It extends very far from ones body. Some of the reason for this is the extra room in it for accessories. I really did not need that, and as it was to be used in the winter, the extra padding on the side against clothing was also not needed. Otherwise it would be a very sturdy case. it appears very strong and would offer good protection. Rated 2 out of 5 by mhubel from Very large I purchased this with the intention of using it sking. It is enormus. While the D7000 with a 18-105 lens does fit, even just makes it with the shade on, the outside dimensions are much to big to be carring around. The camera and lens just are not that big. There is a lot of wasted space and for the intended use, the extra pockets are of no value. A lot of the extra size is also made up by padding which might make it more confortable in the summer but is of little value in the winter. In practice I may never use it. 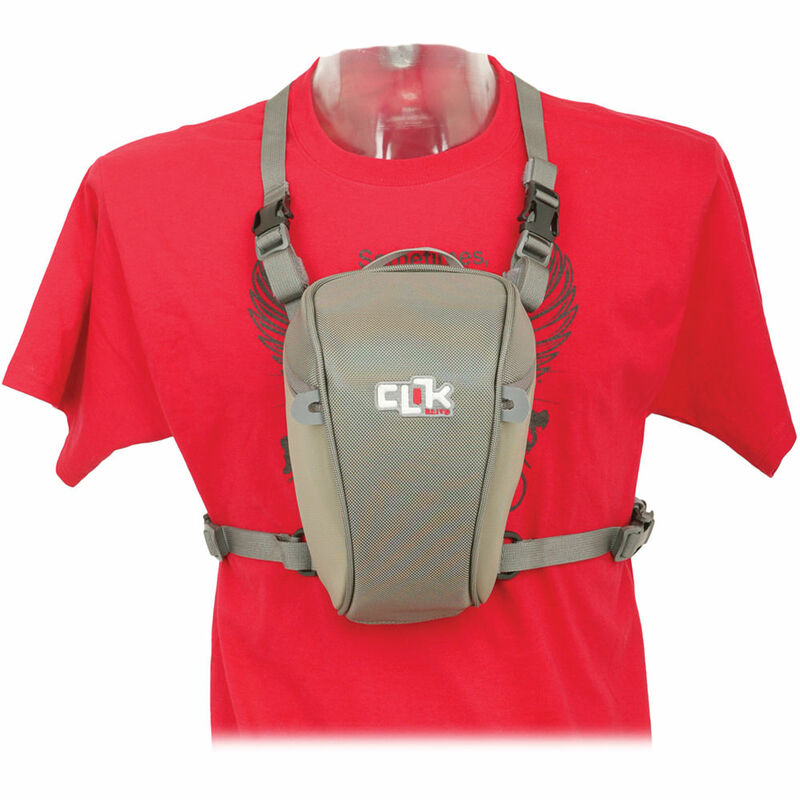 Rated 4 out of 5 by Gregory from Good for Active Use The Clik Elite Chest Carrier is a good product. I've used it when hiking, when carrying a camera in a backpack or shoulder bag, would be too cumbersome to use. The build quality is excellent, as all materials, buckles, and stitching are first rate. I use it with a Nikon D610 and a Nikon 28-200 G lens which has a length of 5.5 inches. This is the stated max. camera + lens combo from the Clik Elite literature. With the D610 + 28-200 G in the carrier it is a snug fit. If I try to carry an extra battery in the zippered enclosures under the lid, the fit is very tight, and it is tough to zip the lid shut..forget about carrying a polarizing filter, lens tissue and lens cleaner...perhaps carrying something as thin and small as SDXC cards would be okay, though. The X type of harness is comfortable, and is farily easy to get into, and out of. I get no pain in the shoulders from carrying this carrier and D610. The reason I gave it 4 instead of 5 stars is because if Clik Elite states 5.5 inches is the max. length of camera + lens combo, it still should have enough room to use the zippered pockets under the lid. Perhaps the true effective camera + lens combo length is more like 5.0 if you plan on filling up the pockets under the lid. Additionally the curved design of the carrier bottom is curved so severely that the bottom inch or so of the carrier cannot be utilized, thus wasting precious space. Yes, they should have curved it but not so much, so one can utilize more of the carrier depth. Additionaly, I downgraded the carrier because of the goofy concept of placing huge Clik Elite logos right on the front of carrier and also on the padded portion of the strap...I feel like a walking billboard in the backcountry! Truly tasteless logo placement IMO. When I bought the carrier I also bought a roll of grey gaffers tape to cover up these logos. Rated 5 out of 5 by BlackBear from Great Hiking Pack Spent years looking for a front pack to hike/backpack with my DLSR. Have used this on multiple trips and like the versatility of this pack.